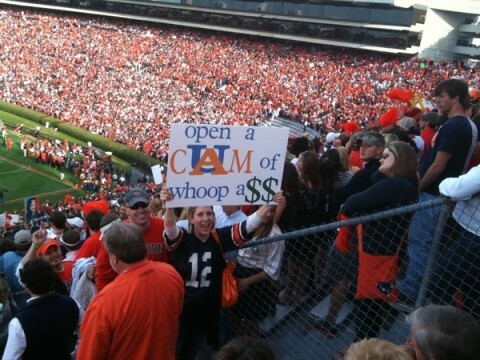 OK, folks, I’m going to propose a new rule: DO NOT make an interlocking AU with the “a” in Cam when you’re making signs. If someone reads it the wrong way, it can be… unfortunate. not to mention the $$ being a little … unfortunate. Take this post down plz heh. Fans need to use some common sense when making signs, or T-shirts, or whatever. Auburn can get into trouble for things like this. Also, I have read some comments from fans about Cam being worth the money if he really did get paid. Wrong is wrong, folks, no matter who you root for. There is no need take this post down. The $$ are why this was worth posting in the first place. I don’t think that there’s any danger that this sign or post is going to goad the NCAA into sanctioning the program when they wouldn’t otherwise. I see this as chronicling history in the making. Seriously, don’t y’all think it would have been better to spend money on a secondary :-). How many DBs could one get for 200K (allegedly). I’m talking about the interlocking AU used in the sign–NCAA rules prohibit official logos from being used in association to players. The interlocking AU, although not professional on this sign, is an officially-licensed logo. I just think it’s not in the best of taste. It’s almost like the fan is bragging that the University paid the kid. Is it funny? Sure. Is it embarrassing? Uh, yeah.